Blue Ivy may be just 6 years old, but she’s already calling some shots in the Carter clan. 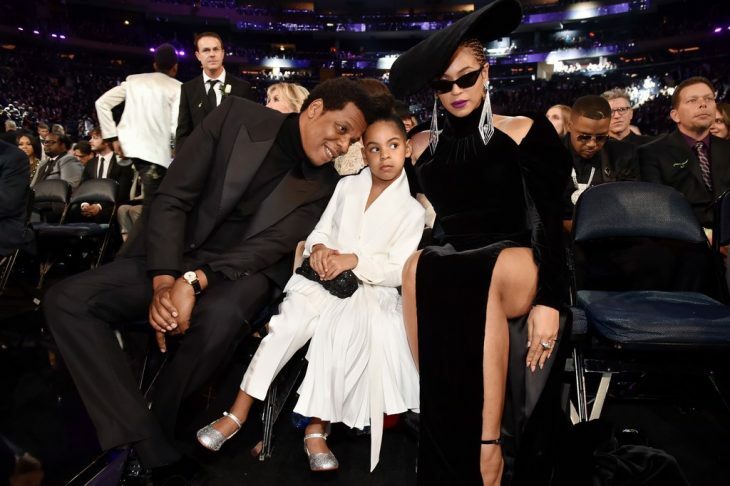 The First Family of music turned heads on Sunday as they attended the 2018 Grammy Awards together , and it seems little Blue had to keep her superstar parents, Beyoncé and JAY-Z, in line. Footage from the ceremony showed the little girl motioning for her parents to quiet down as they applauded while Camila Cabello gave a moving speech. As the couple — who welcomed twins in June — clapped, Blue is shown putting up her hand and gesturing toward both her mother and father. “Blue let them know who’s REALLY in charge here,” one Twitter user wrote in response to the clip of the adorable incident. At the show, little Blue rivaled last year’s look in a chic white ruffled coat, matching trousers and sparkling silver shoes. JAY-Z, who was nominated for eight awards, looked dashing in an all-black suit, while Beyoncé wore a high-neck black velvet gown featuring cut-out shoulders and a solo front panel, finishing the look with shoulder-length earrings, dark shades, a large black hat and purple lipstick. The couple’s eldest child manages to steal the spotlight every now and then. Recently, she showed off her rapping skills on “Blue’s Freestyle,” which is a cut from his 4:44 album. Like the daughter of a pair of music moguls, Blue rapped: “Everything everything this is my only single thing/Everything I hear is my answer/And if you think I say, then innocent if I say?/ I never hear that, I be in the posse,” she raps.